My homebrewing setup is pretty damn cool. It's a Brutus 10. 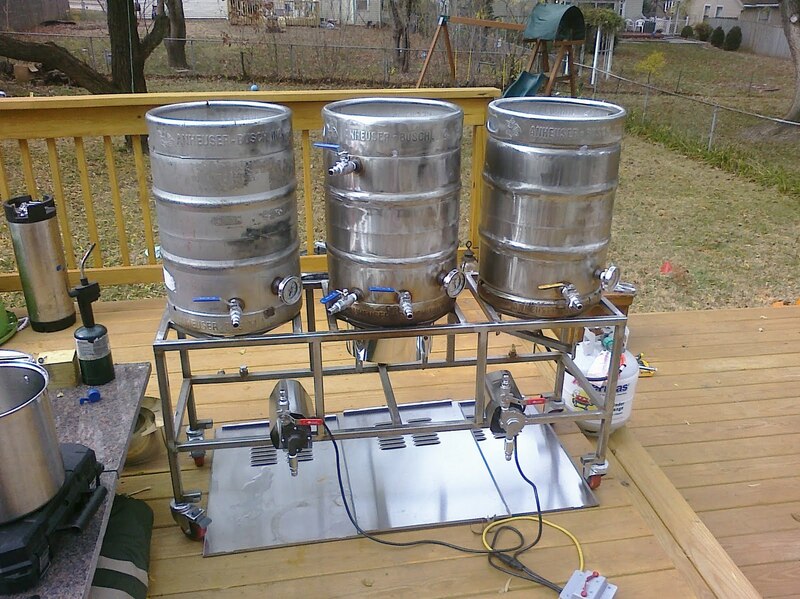 The Brutus 10 is a homebrewing system designed by NASA rocket scientist Lonnie Mac. Why did I build one? Well look at it! OK besides being a gorgeous brew system, the one area I struggled with the most in homebrewing was repeatability. People wonder why I would want to brew the same beer more than once, and something I've learned is that if you really want to improve a recipe then you need to brew it over and over again. With each rebrew you make a small adjustment and keep everything else the same. It's that “keep everything else the same” part that I've struggled with. That's where the Brutus 10 comes in. It allow me to brew consistent batches and eliminate (or drastically reduce) those days where nothing goes as planned and I don't have a clue as to how the beer will turn out. Do you want to build a Brutus 10? My goal is to make this the best resource in the world for building your Brutus 10. Building it wasn't easy. I learned a lot and want to share that knowledge with other brewers so you can have the same sense of pride I have when I fire up my burners. Full a detailed cost breakdown please refer to the posts in the series. Please read the entire articles and all the comments (use Ctrl + F to search for keywords) before asking a question. If you ask a question, try to comment on the relevant post. For example ask your electronics question on the electronics post. Good luck! I just got my plans a couple weeks ago and plan on piecing one together as money and time permits. Thanks Blake. Keep us posted on your build. Maybe we can save each other from making mistakes. looks good and I agree you. -I have those QD’s, I think I would go tri-clamp or the cam style which I have seen lately. The rings get a bit sticky with time and work best when hot and wet. Of course this isn’t great when working with bare hands. I believe the cams that I speak of can be found at NorthernBrewer. I have spent plenty of $$ at both shops and recommend them both. -I went with 1-1/8″ SS and don’t see any issue with it. Still an overcompensating structure. -Big Banjo is great for your HLT, I think it does the job nicely, but fine tuning the heat for your Boil kettle may be more difficult. I use the smaller 5″(?) burner for my burner it suits me just fine. I work with a HERMS so I don’t currently have a burner for my Mash. Good luck! Looking forward to your updates. Thanks a ton for the tips. I’m curious, what is the benefit of the SS chugger head? Is it because you’re attaching SS fittings to it? Also, do you buy the head separately or does it come as one unit with the pump. I know that you can buy the pump with the SS head attached already, let’s put it this way, while mounting mine on the frame at one time, it slipped, fell, and I ended up with a broken head. SS won’t snap off like poly will. Those are the cam locks and that’s the same site I found them at. gas beam, my welder spent hours tracking down a leak. He said that if he were to do it again, he would seal off the gas beam (end-caps) before welding it in to place. I had my brother buld the Brutus stand using the dementions in the specs. If I were to build another I would make the Brutus two inches deeper and two more inches between kettles. I would lower the lower cross beams two inches to accommodate the Honeywell gas valves. Also, I would use the Hurricane burners rather than the jet. Actually the burner beneath the mash tun could be a much smaller burner as there is less need for high heat. I made the mistake of powder coating the Brutus. Next time I will use high temprature paint. I would definitely put flame guards around the burners. The gas beam is fantastic. I have instant flame and great control. Originally, I was going to use PID temprature controls but the way I have mine set up I have easy and perfect control. I run a RIMS/HERMS system and three pumps. Makes it a very simple to use. I just had to wipe the drool away. That’s going to be some impressive equipment. Good luck on the project and I can’t wait to see the completed project. Haha thanks Mike. Once this thing is built and at my house I don’t think I’ll ever stop drooling. I can’t wait to see how is goes. I’m currently talking to a few welders, but I’m not going stainless. I have heard some comments regarding the gas beam. I need to check out what Lonnie did, but a few people I have talked to have had gas flow problems. Cool Robert. Yea I figured I’d give the gas beam a try and if it doesn’t work out I can go a different route. You know I was reading a post about flow problems the other day and someone had a tip that completely solved the problem. I should find that in case I run into the same thing. The potential problem with the gas beam is that propane tanks have a built in “valve” the shuts down in case of a line break, kind of a safety valve. Because the gas beam has such a large capacity, when filling the tank may think is has a break. There may be a way around this valve, but I’m not sure. One builder locally in just hiding the gas line within the beam. Still looks clean but without the flow problems. Hm I didn’t know they had an internal valve like that. My plan as of now is to hook up a low pressure system like Lonnie’s. The good thing is it’s pretty easy to go high pressure if it’s needed just be switching out the regulator and orifices. I may even go high pressure on the BK, but I doubt I’ll need it on my system. Major build Billy! Looking forward to seeing your progress. Made some very big steps forward in my build last night over a few pints. I’m getting an HVAC structure from a contact that is about the right dimensions. I need to put a few more supports in, but for free it was a great find! Also, lined out all the fittings I need. Should be getting all of that in the next couple of weeks. Sounds like everyone at the Academy is in the process of building. We need to get Ryan and Vanessa in on the action! Actually Ryan told me he was in the midst of building a Brutus. Now we just need to get on board and we’ll have a nice fleet of systems among us. I faltered for a sec, thinking I should switch over to building a Brutus 10, but I’ve made up my mind. I’m making an Ellison. I need to rent an artists/architect and brain dump on him so that he can draw this out for me. If I do it, it’ll end up being in crayon. Hey, how did the build go? Did you finish your build? I am actually thinking of doing it too, how much did it cost you from start to finish? Hey Val, I did finish the build in the sense that I’m brewing beer on it. There are still some mods I want to make, but it’s 95% there. I haven’t done a detailed cost breakdown yet, but it’s going to come out to about $3,400 which includes $1,200 for the boilermaker kettles and $200 for the therminator. Those are areas you could save money. So what burners did you go with. I’m in the middle of making mine and I can’t decide. and how are the March High temp, high flow working out for you? I went with the BG12’s from Amazon. More info here: https://homebrewacademy.com/brutus-10-gas-system. The March pumps work great. Only problem is that the threads are starting to get damaged on one. I may switch to SS heads eventually. Have you had any problems with the frame being able to support the weight using the smaller 1.5″ tubing and thinner wall thickness. I am starting to gather parts for my build and am also considering the 1.5″ tube….its much cheaper! No problems at all. I’m pretty sure the stand could support a tank. Good luck! Thanks! And thanks for posting your process building this, it has really helped me process my own build. I use 3/4 and have never had a problem. That’s good to know, it seems 2″ is major overkill. My biggest concern was wall thickness going from 0.120″ to 0.065″ and then putting high amounts of heat into the system. However since I work with metallurgists and Engineers I have easy access to technical data on metal and yield strength. 304 stainless does not lose its strength and ductility until it reaches temps over 900F, and then its on curve dependent on time and heat input. If the 0.065″ wall can hold 3 pots full cold then it should be able to do this at hot brewing temps below 900F. What gas valves did you use? Also did you decide on the BCS? Last question for now 🙂 How did you handle the pilot light aspect? Thanks! Would love to see some pictures of the completed system…. If you have any more questions feel free to leave a comment. Cheers. I’m wondering if you’ve made any 5 gallon batches with your system? Wondering how the 15 gallon pots would serve for 5 and/or 10 gallon optionality. Great looking setup! Would you change anything if you were to create another system? Love the brew rig and the kettles look great! Nice pump shield! It is exciting to see that the craft beer is booming in the world. We are in China, craft beer conception is still a baby here. People have very few knowledge about craft beer. But we realize the changs recent years. Young people star to notice that in big cities. Craft beer brewing is really different with other industrial. People tend to share any ideas and create new things. And customers tend to try different flavors of beers. This may be why there can be more than 40 breweries running well at a small tone in USA I ever seen. Great write up. Have been wanting to automate the gas burner for sometime. The plumbing instructions were very good. Used some of the wiring to modify my setup. Using dual PIDs for now while I figure out the RaspberryPi setup. Would like to go to more automation.